H. Brandt Ayers, longtime editor and publisher at The Anniston Star, has written a memoir with a unique perspective on his beloved Southland. Writing with historical perception, political awareness, and abiding sensitivity, he has given a history of the South’s painful road from Civil War to the latest New South, a land of culture and prosperity, one in being with the nation yet still maintaining some semblance of the gentle, polite past. His narrative brings us through the hard scrabble years of the Great Depression, the tumult of the civil rights era, and the Republican takeover. 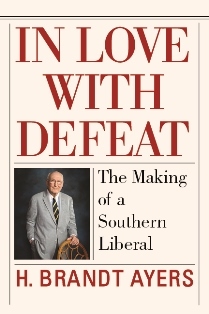 If you want to understand the Southern psyche, this book is mandatory reading. Ayers, arguably, picks up where venerated historians C. Vann Woodward and W. J. Cash left off. Through it all, The Anniston Star has been the voice of liberalism in the state. Indeed, in the 1960s the local epithet was often The Red Star, when segrationists saw the newspaper as a catlyst in the destruction of their “way of life.” The reviewer spent five years sharing that tough time in a city known as “a hard town” in the civil rights battle. The Star never wavered in the fight for truth and justice. As a journalist Ayers—Brandy to everyone who knows him—preached that his newspaper should report on things of substance, not just the latest bizarre happening in the day’s news. He also fostered a belief that the newspaper could creat a positive approach rather than a paralyzing cynicism about politics. Ayers sprang from a grandfather and father who were bascially liberal, albeit in the context of their own times. That soft liberalism espoused by Dr. T. W. Ayers and Harry M. Ayers was a far cry from the broad view that Brandt came to hold. His conversion, planted at home, was nurtured in North Carolina where he covered such progressives as Terry Sanford and Luther Hodges while back home Alabama ran amuck with the likes of George Wallace and Bull Connor. With delightful humor at times, he relates his changing view, culmininating perhaps in a Capitol visit with Mississippi Rep. Frank Smith who said, “Boy, there’s some things you need to know.” and then shared them. “What the congressman told me that afternoon was a revelation, and my reaction was further evidence that I had evolved into a commited Southern liberal—a lonely species, too hot for home, but not hot enough for high-church liberals in Manhattan and Los Angeles,” writes Ayers. Ayers’ trips to Russia anad China add a further international dimension to this memoir. Especially interesting is when he and his wife visit the section of China where his grandfather served as medical missionary for twenty-five years. But Ayers’s life has been more than just politics and civil rights. He was a founding member of the L.Q.C. Lamar Society, which sought to provide a platform for progressive economic as well as social change. His wife, Josephine, was instrumental in the founding of the Alabama Shakespeare Theatre, since relocated to Montgomery. The family and the newspaper have long been devoted to the arts in Anniston. Perhaps even more telling of the family’s commitment to a quality of life is the future of the family-owned newspaper. The family turned down an offer of $50 million for the sale of their six newspapers (two dailies and four weeklies). Instead the stock is pledged to a foundation that will keep the newspapers local and community oriented rather than part of some corporate entity interested only in the bottom line. It is an extraordinary gesture. One disappointment in Brandy’s thoroughly engaging memoir is the omission of the details in Ayers’ masterful portrait of the big picture. It is unfortunate that some of the staff members from the newspaper are sort of lumped together as such. Two I recall fondly are Jean Quillen and Cody Hall. Jean was a brash, driven reporter who would not hesitate to steal a story off a colleague’s beat, but also she was an indefatigable investigator. She, too, was threatened many times for her dedication to duty. Cody, executive editor in the 1960s, was every reporter’s favorite boss. He was bright, witty, inciteful, and unfailingly calm when things hit the fan. But overall this is a fine read. Bill Plott is a freelance writer and retired journalist in Montevallo.